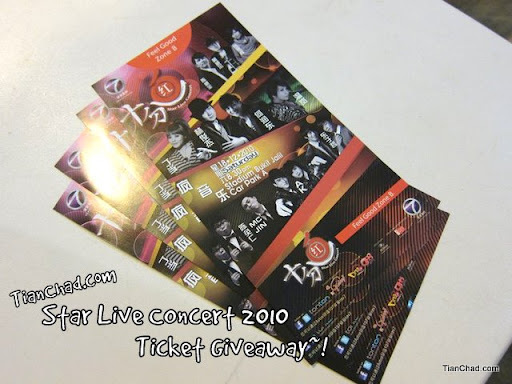 NTV 7 Star Live Concert 2010 [十分红演唱会 2010] Tickets Giveaway! How to enter TianChad.com NTV 7 Star Live Concert 2010 Tickets Giveaway? "I want to win @NTV7 Star Life 2010 Concert Tickets from @TianChad cos I wanna see _____(Artist Name) perform live! http://bit.ly/NTV7StarLive"
3. Press the Like button at the end of this post. The Contestant must finish the 3 steps mentioned above for this contest. Winner will win a pair of tickets for the concert Feel Good Zone B.